Recently, Jerry and I drove into a bright fall day on a mission; only after our trip began did I realize he had a covert aim as well. Jerry’s primary task was to gather interesting pieces of pine that he could use in furniture and other wood-working. He lured me into accompanying him in a clever move to take my mind off my frustration. The day before, I’d been disappointed to receive the finished product for a project I’d been working on for a couple of years, and found it did not meet my specifications or my expectations. Angry and hurt, I’d talked– no doubt too much– about the betrayal of my confidence and my contract, berating myself for being so trusting. Jerry’s paid permit allowed him to search particular piles of trees and brush chopped and stacked for burning by the U.S. Forest Service. The map of our permit area led us north and west into the Black Hills, into steep valleys echoing with running streams. High above us, grassy slopes tilted toward cliffs layered in broken rock. The sun shone, but the fall air was like cool silk on our skin. Birds flashed in the underbrush, busily gobbling seeds to fatten themselves for winter. Names on the map always hint at stories we may never know: Wild Irishman Gulch, Loveland Canyon, Hat Mountain, Steamboat Rock, and Paradise Valley. According to South Dakota Geographic Names, Bogus Jim Creek, which rises just south of Buck Mountain in northern Pennington County, lets the explorer choose which history to believe. The rivulet may have been named for a prospector, Francis Calabogus, known as Bogus Jim, who located a claim on its banks. Alternatively, it may have been named by gold seekers who thought they had reached Jim Creek, farther northwest; discovering they were trying to mine gold on a dry creek, perhaps they named it Bogus Jim. Not a burl, just a knot-head. The story of our day found us parking beside a huge slash pile with hundreds of dead pine trees waiting for winter’s torch; they’ll be burned by the Forest Service if enough deep snow accumulates around them. If winter is dry, they’ll dehydrate and rot for another year or two, available to firewood seekers and artists. Jerry took a hand saw and went along the front of the pile, while I went around the back. First I inhaled the tart smell of sun-warmed pine which always reminds me of my grandmother and her house in a southern Black Hills canyon. My second breath included a more pungent stink; at my feet was a low-growing plant that spreads into branches with yellow blooms: fetid marigold. Plant books describe its odor as “foul” and the genus name, Dyssodia papposa means “evil-scented.” I’d call it bitter but invigorating, somewhat like eucalyptus. Authorities say the Lakota used the powdered leaves to relieve difficult breathing and European settlers brewed tea from the leaves to settle the stomach, stop vomiting and to treat diarrhea. I wouldn’t make a bouquet of it, but I find the odor invites me to breathe deeply. Sunlight lit up a few brownish-gold leaves on the oaks, reminding me summer is over. Lush green plants were growing up through the furrows and tracks left by the heavy machinery used to cut and pile the trees. White yarrow bloomed, and kochia thrived in the gouges. Purple asters shivered on slender stems, and patches of bee balm were going to seed. Along the edges of one slash pile raspberry bushes stood knee-deep. Noting how many chunks of wood had been scattered down the hill by the machinery bringing gulps of trees to the pile, I kept angling upward. As I climbed the hill, reaching to pull myself up by protruding rocks and branches, the sun warmed my back. My leg muscles knotted and flexed and my feet felt as if they were digging into the soil for purchase. I’d find one or two nicely torqued branches and carry them back down the hill, stepping carefully so as not to fall. Then I’d start uphill again in a slightly different place, looking carefully at each piece of wood, tugging at buried limbs, pushing some aside to get at the deeper ones. As I worked my body, I began to feel the tension in my shoulders ease. My vision narrowed; I focused on the purple flowers and the light slipping between the tree trunks, and how the pines stood against the sky. At home, I would have been seated at my computer, with notes on scraps of paper covering every inch of two desks, working on several jobs as I kept an eye on the clock so I’d remember to get lunch on the table at noon. I’d be re-running email arguments in my head and muttering to myself about perfidy and ignorance. Now I reminded myself that all I had to do was peer into the tangled dead tree branches and brown needles, searching for twisty pieces of pine. That’s all. Tomorrow I might consider the best remedy for my dissatisfaction, but today I had no responsibilities to anyone or anything but the wish of this good man for wood that would inspire his creativity. 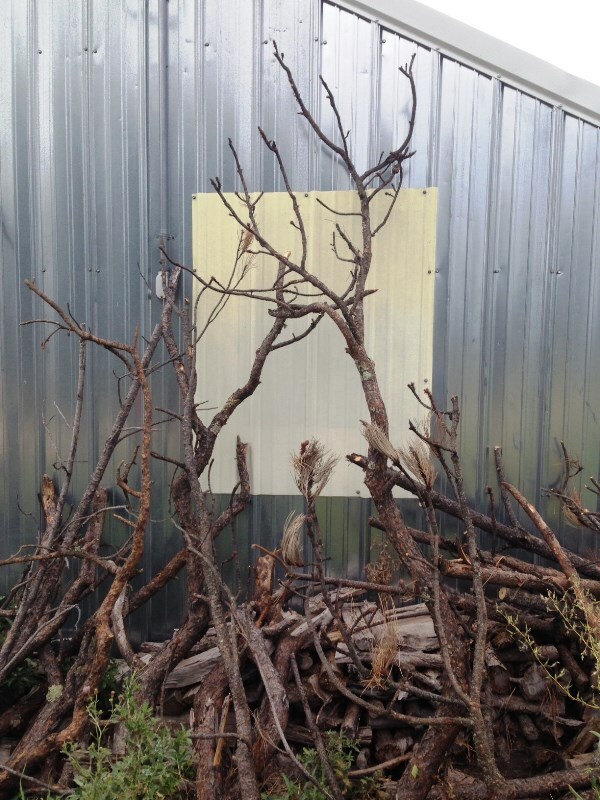 I leaned close to the slash pile and began to really see the way the branches wound among each other. When I carried a couple of twisted branches back to the pickup, Jerry happily pointed out a burl he’d found, a rounded knotty growth of wood. Handcrafters love these wood variations, polish them, and work them ingeniously into furniture, picture frames and other useful and beautiful objects. This one was no more than three inches across, but would make a fine addition to anything he built. A table beside his rocking chair in our bedroom features several burls among the braces for its legs. At once I was galvanized! A quest! I’d find a burl! I dashed back around the slash pile. The twisted, mossy old root. Again I was distracted: a gleam of gold was a cluster of the type of sunflower that thrives in sunny spots in the hills. Poison ivy grew abundantly around several stumps. 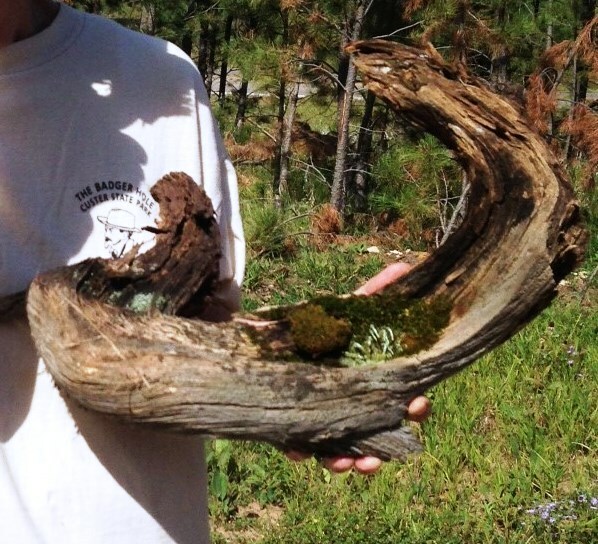 For myself, I collected a beautifully twisted old root fragment with green moss growing on its top edge, and slender white stems in a little hollow. I put the piece on a stump so I could find it easily. As if the old root had led me to treasure, I immediately started finding beautifully twisted, sturdy pine branches scattered down the hill, all in lengths I could carry. I piled them by my stump until it was surrounded. As I started downhill carrying an armload of pine branches that writhed over and under one another, my rear ankle caught between two branches. I could picture myself falling, twisting my damaged knee or breaking an ankle or arm. I lunged hard, jerked free and staggered until I regained my balance. Jerry helped me load my finds, generously praising the collection. Sweating and happy, we drove back to the gravel road to locate another couple of slash piles. Even this fairly remote area was busy with four-wheelers, pickups hauling trailer loads of four-wheelers, pickups hauling campers, and the occasional jogger or bicyclist headed somewhere. Around us stood Crystal Mountain (with many crystal formations), the Lucky Strike Mine, Pilot Knob, and more. Dust hung in the air, sparkling in the sunlight. Marks on the map drew people along the trails and through the trees: Benchmark, Silver City, Thrall Mountain. The twisty pine branches we collected. Some of the piles we searched were so tangled that even if we spotted a promising branch, I couldn’t dislodge it, though Jerry might be able to cut it loose with the hand saw. Sometimes he was in sight, and sometimes I seemed to be alone in the woods. We’d work our way around a hoard and then wander down the road to the next. Picking at the edges of the mounds, we muttered about the beautiful pieces of pine we just knew were hidden deep inside. 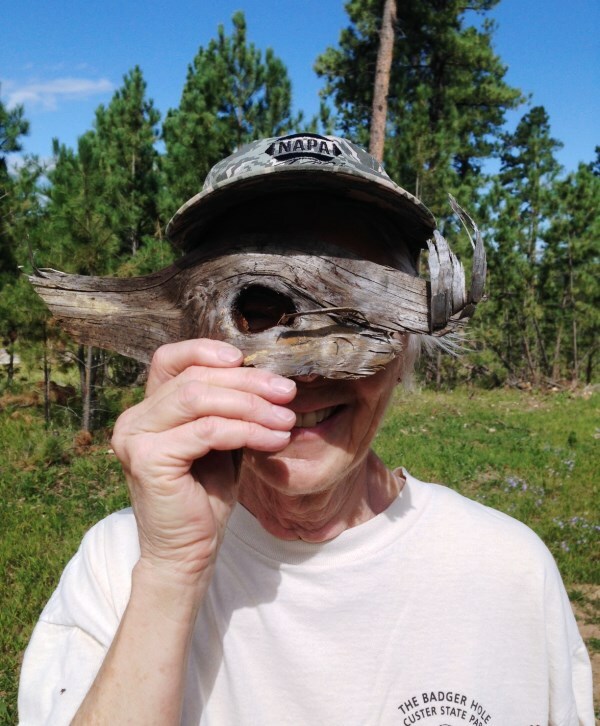 As the sun grew warmer, we collected dozens of pine branches in fascinating shapes, tangled, entwined, twisted, tortured: all material for beautiful furniture or picture frames or something amazing Jerry will make during the winter to come, or in some future winter. Though I stared among the branches until my eyeballs ached, I found no burl. But the burl hunt failure was a triumph in the most important way for me: I didn’t once think of incoherent emails, whining phone calls or broken promises. Instead, searching for wood, I began to see the writing metaphor: a slash pile is a draft, logs, branches and discarded soft drink cans all piled in an untidy mess on the edge of the forest. A careful writer must tiptoe around it, peering close and reaching into the web for the ideas that will polish up nicely. Somewhere in that jumble is a burl, a beautiful knot of meaning but only patience will tease it out. At nearly noon, Jerry declared we’d collected enough, and tied down our load. 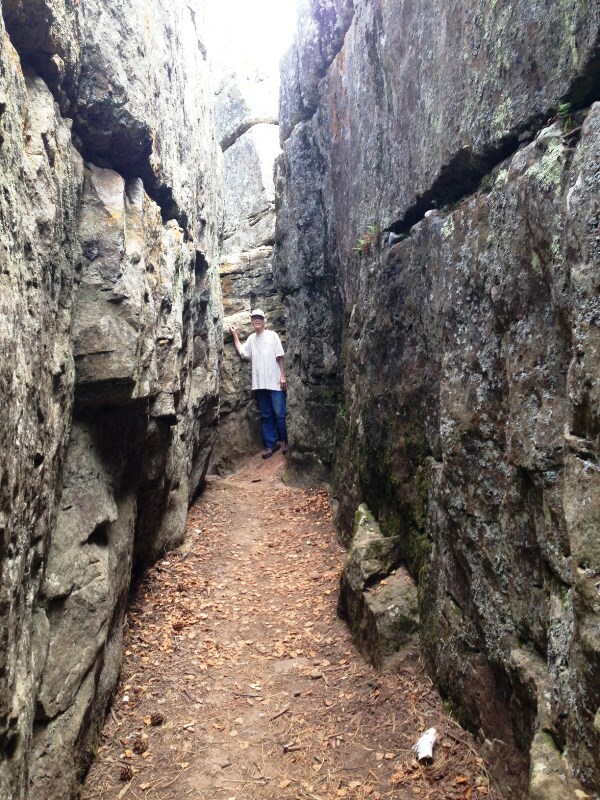 We drove to the Rock Maze, a geological marvel near Steamboat Rock. All morning, we had noticed giant slabs and boulders marching along the cliff edges high above the roads we traveled. At the Rock Maze, these great stones swoop low enough to lie near the road, accessible with an easy stroll. Most of the stones are at least ten feet high, cracked and tumbled so they offer places to squeeze between. Trails lead deeper into the maze, or out to the top of the rocks, or into a corner so small you cannot go on. We could look down into massive cracks and wave to people staring up at us, or leap small crevices leading to pockets of bushes growing from a fissure where we heard voices. The fractured rock led us around corners, into dead ends, up walls and into gaps we had to bend to slip through. Jumbled among the stones were massive charred stumps and lengths of pines that had fallen across gaps and dived into fissures. The sarsen stones reminded me of Stonehenge in their immensity and the way they lured people to walk among them. Several young men stood on the edge of one precipice, holding their cameras out on poles to take pictures of themselves in that precarious position. We saw a man with a heavy back pack, watchfully leading a girl and boy no more than six years old. All three carried hiking sticks and the children chattered happily to each other. One couple disagreed gently over whether to leap over a gap between rocks; he did, and she went to a spot where the rocks were closer together. By the end of the day, I had realized that, while the work done by others didn’t satisfy me, I could still feel proud of my own accomplishment. Anger at something I can’t change is like the burl that might have become a branch. A burl could vanish into the burn pile, or become part of something beautiful. And the burl is not the tree’s whole story. 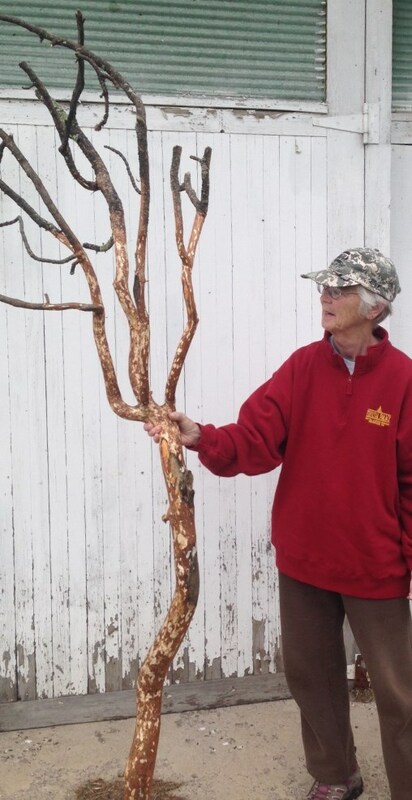 A day or two later, Jerry had peeled one of the most convoluted branches, displaying the white inner core and the brown middle layer. Seeing what he had made of the discarded branch made me see more clearly the substance of the wood as well as my own situation. I was the casualty of a born victim: an individual who is never responsible for his or her own actions. Unsatisfactory results are always the fault of someone else. Misunderstanding follows these folks everywhere. But they are not evil. The only sensible response to these folks is pity for their perpetual confusion. If I refused to be drawn into an exchange of incivilities, I could go on to more important work. I failed to find a burl, but I found something more valuable. I learned from my own errors in judgment. I have devised ways to handle the next creation differently so as to avoid the problems this one encountered. This is the precise process that should be followed by a writer in revising each succeeding draft. Oh yes– Wild Irishman Gulch may have been named either for a single genial, boisterous Irishman who once lived there, or several Irish prospectors. Sadly, Loveland Canyon was not named for romance, but for a couple of ranchers who arrived in the late 1870s, Ed and Charles Loveland.